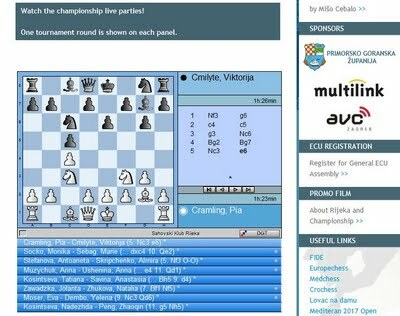 The last round of the European Chess Championship just started. You can see the very first moves of the games on the image above. 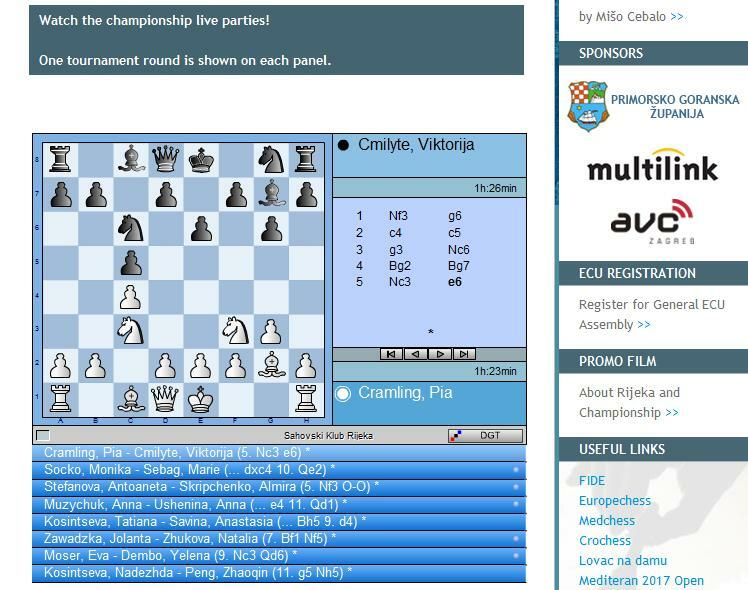 The winner will be decided in the direct encounter between Pia Cramling and Viktorija Cmilyte. While we are waiting for the final result of this exciting tournament, let me tell you some news about women's tournaments around the world. 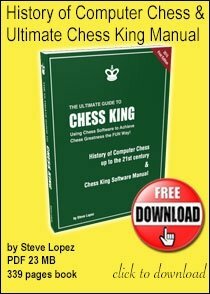 From March 3 to March 14, 2010, Iranian Chess Championship Finals for Men and Women took place. In the women's final the 16-years old WFM Ghazal Hakimifard defended the lead and eventually won the women championship by collecting 10 points from twelve games. 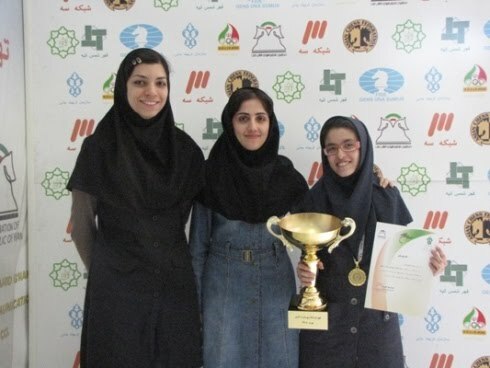 The winners of the Iranian women's chess championship 2010. 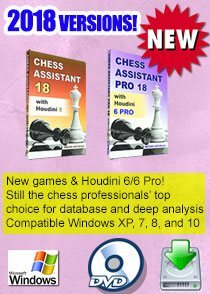 Last year champion WGM Atousa Pourkashian finished second with 8.5. 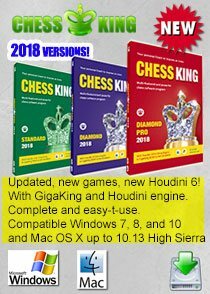 The full reports with photos and results can be found on chessdom.com. I visited Iran in August 2001 and played with the best girls of the country. Since women in Iran can officially participate only in very limited number of sports and chess is one of such sport, chess is very popular among women and girls. The women's Iranian team on the Olympiad 2006 in Torino. 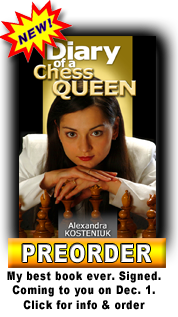 I faced Iranian girls also at the very top level competition, for example, in the Women's World Chess Championship in Nalchik in 2008 where I played against Atousa Pourkashian in the first round. As the web-site The Week in Chess reports from March 8 to March 14, 2010 the Parachute Advansed International took place in Cox's Bazaar, Bangladesh. 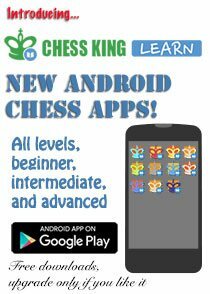 Organised by GM Niaz Murshed of organisation Six Seasons Chess Tornaments. Manisha Mohanty Kiran was the convincing winner by a point and a half on 7/9. That's nice to see so many women's tournaments played all around the world. 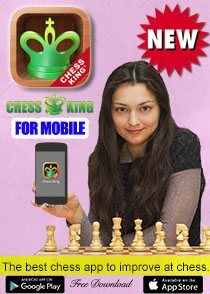 If you know about a women's tournament in your country or your community and would like to share it with the world, write me an email with your article and photos. 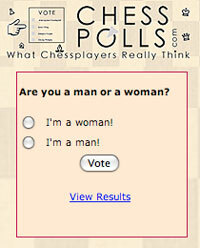 I'm sure that if we all unite our efforts in making chess and women's chess more popular we will succeed!